STONY POINT – Finishing off the end of a terrific 41st season, Penguin Rep Theatre presents “After,” a timely new play examining parenting, bullying and fallout from a school issue. Written by the award-winning author of “Daniel’s Husband,” Michael McKeever, and directed by Penguin’s own Joe Brancato, “After” is provocative and moving as it follows the journey of two families as they pick up the pieces of their lives and children after the news camera have gone home. Parents Connie and Alan Beckman (played by Denise Cormier and Bill Phillips) arrive at the home of Julia and Tate Campbell (played by Victoria Adams-Zischke and Michael Frederic) to discuss a sensitive issue regarding their children. When it comes to protecting their son, the Beckmans will do anything, but the Campbells feel the very same way. Following a terrible incident, leaving one son dead, the two families must come together to figure out where they went wrong, and who is truly to blame. 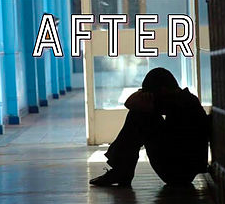 “After” is a story reminding viewers of the importance of forgiveness, especially within yourself. The limited engagement of “After” runs from Friday, September 21 through Sunday, October 14 and the Penguin Rep Theatre in historic Stony Point. Performance days and time are as follows: Thursday evenings at 7:30 p.m. and Friday and Saturday nights at 8 p.m., with matinees on Saturdays at 4 p.m. and Sundays at 2 p.m.
Penguin’s intimate, 108-seat theatre, which is located at 7 Crickettown Road, is converted from an 1880’s hay barn, and offers air conditioning, a wheelchair-accessible entrance, rest rooms and plenty of free parking. To order tickets or for further information, visit Penguin Rep’s website at www.penguinrep.org or call 845-786-2873. CREW: Gregory Gale, Costume Designer; William Neal, Sounds Designer; Brian Prather, Science Designer; Martin E. Vreeland, Lighting Design; Buffy Cordoza, Properties/Production Manager; Michael Palmer, Production Stage Manager; Joe Brancato, Artistic Director/Director, Andrew M. Horn, Executive Director; Dana Duff, House Manager.